"Incision" redirects here. For incisions used in surgery, see surgical incision. For incision in geomorphology, see river incision. 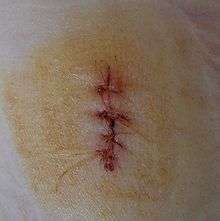 For the band, see Incision (band). For the GI Joe character, see Incision (G.I. Joe). Clean wound - made under sterile conditions where there are no organisms present, and the skin is likely to heal without complications. Contaminated wound - usually resulting from accidental injury; there are pathogenic organisms and foreign bodies in the wound. Infected wound - the wound has pathogenic organisms present and multiplying, exhibiting clinical signs of infection (yellow appearance, soreness, redness, oozing pus). Colonized wound - a chronic situation, containing pathogenic organisms, difficult to heal (i.e. bedsore). Incisions or incised wounds - caused by a clean, sharp-edged object such as a knife, razor, or glass splinter. Lacerations - irregular tear-like wounds caused by some blunt trauma. Lacerations and incisions may appear linear (regular) or stellate (irregular). The term laceration is commonly misused in reference to incisions. Abrasions (grazes) - superficial wounds in which the topmost layer of the skin (the epidermis) is scraped off. Abrasions are often caused by a sliding fall onto a rough surface. Avulsions - injuries in which a body structure is forcibly detached from its normal point of insertion. A type of amputation where the extremity is pulled off rather than cut off. Puncture wounds - caused by an object puncturing the skin, such as a splinter, nail or needle. Penetration wounds - caused by an object such as a knife entering and coming out from the skin. Gunshot wounds - caused by a bullet or similar projectile driving into or through the body. There may be two wounds, one at the site of entry and one at the site of exit, generally referred to as a "through-and-through." Hematomas (or blood tumor) - caused by damage to a blood vessel that in turn causes blood to collect under the skin. Crush injury - caused by a great or extreme amount of force applied over a long period of time. Fresh incisional wound on the fingertip of the left ring finger. The overall treatment depends on the type, cause, and depth of the wound, and whether other structures beyond the skin (dermis) are involved. Treatment of recent lacerations involves examining, cleaning, and closing the wound. Minor wounds, like bruises, will heal on their own, with skin discoloration usually disappearing in 1–2 weeks. Abrasions, which are wounds with intact skin (non-penetration through dermis to subcutaneous fat), usually require no active treatment except keeping the area clean, initially with soap and water. Puncture wounds may be prone to infection depending on the depth of penetration. The entry of puncture wound is left open to allow for bacteria or debris to be removed from inside. Evidence to support the cleaning of wounds before closure is scant. For simple lacerations, cleaning can be accomplished using a number of different solutions, including tap water and sterile saline solution. Infection rates may be lower with the use of tap water in regions where water quality is high. Cleaning of a wound is also known as 'wound toilet'. If a person presents to a healthcare center within 6 hours of a laceration they are typically closed immediately after evaluating and cleaning the wound. After this point in time, however, there is a theoretical concern of increased risks of infection if closed immediately. Thus some healthcare providers may delay closure while others may be willing to immediately close up to 24 hours after the injury. A single study has found that using clean non-sterile gloves is equivalent to using sterile gloves during wound closure. 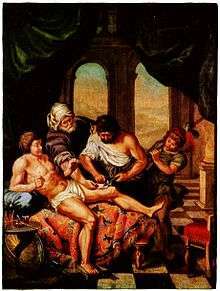 If closure of a wound is decided upon a number of techniques can be used. These include bandages, a cyanoacrylate glue, staples, and sutures. Absorbable sutures have the benefit over non absorbable sutures of not requiring removal. They are often preferred in children. Buffering the pH of lidocaine makes the injection less painful. Adhesive glue and sutures have comparable cosmetic outcomes for minor lacerations <5 cm in adults and children. The use of adhesive glue involves considerably less time for the doctor and less pain for the person. The wound opens at a slightly higher rate but there is less redness. The risk for infections (1.1%) is the same for both. Adhesive glue should not be used in areas of high tension or repetitive movements, such as joints or the posterior trunk. In the case of clean surgical wounds, there is no evidence that the use of topical antibiotics reduces infection rates in comparison with non-antibiotic ointment or no ointment at all. Antibiotic ointments can irritate the skin, slow healing, and greatly increase the risk of developing contact dermatitis and antibiotic resistance. Because of this, they should only be used when a person shows signs of infection and not as a preventative. There is moderate evidence that honey is more effective than antiseptic followed by gauze for healing wounds infected after surgical operations. There is a lack of quality evidence relating to the use of honey on other types of wounds, such as minor acute wounds, mixed acute and chronic wounds, pressure ulcers, Fournier's gangrene, venous leg ulcers, diabetic foot ulcers and Leishmaniasis. There is no good evidence that therapeutic touch is useful in healing. More than 400 species of plants are identified as potentially useful for wound healing. Only three randomized controlled trials, however, have been done for the treatment of burns. An electroactive material developed by NASA has been found beneficial as a wound dressing. It uses electrical activity (generated by body heat and the pressure of cell growth) to facilitate the wound healing process while protecting the wound. The bandage is fabricated from polyvinylidene fluoride, or PVDF, a thermoplastic fluoropolymer that is highly piezoelectric when poled. Bacterial infection of wound can impede the healing process and lead to life-threatening complications. Scientists at Sheffield University have used light to rapidly detect the presence of bacteria, by developing a portable kit in which specially designed molecules emit a light signal when bound to bacteria. Current laboratory-based detection of bacteria can take hours or days. Wounds that are not healing should be investigated to find the causes; many microbiological agents may be responsible. The basic workup includes evaluating the wound, its extent and severity. Cultures are usually obtained both from the wound site and blood. X-rays are obtained and a tetanus shot may be administered if there is any doubt about prior vaccination. ↑ Thomas, A.C.; Wysocki, A.B. (February 1990). "The healing wound: a comparison of three clinically useful methods of measurement". Decubitus. 3 (1): 18–20, 24–5. PMID 2322408. 1 2 Eliya, M.C. ; Banda, G.W. (7 September 2011). Eliya, Martha C., ed. "Primary closure versus delayed closure for non-bite traumatic wounds within 24 hours post injury". Cochrane database of systematic reviews (Online). 9 (9): CD008574. doi:10.1002/14651858.CD008574.pub2. PMID 21901725. ↑ Perelman et. al., V.S. (March 2004). "Sterile versus nonsterile gloves for repair of uncomplicated lacerations in the emergency department: a randomized controlled trial". Annals of Emergency Medicine. 43 (3): 362–70. doi:10.1016/j.annemergmed.2003.09.008. PMID 14985664. ↑ van den Broek, P.J. (2011). "Sterile gloves are necessary in minor surgery". Nederlands tijdschrift voor geneeskunde. 155 (18): A3341. PMID 21466736. ↑ "BestBets: Absorbable sutures in pediatric lacerations". 1 2 Cals, J.W. ; de Bont EGPM (2012). "Minor incised traumatic laceration". BMJ. 345: e6824. doi:10.1136/bmj.e6824. PMID 23092899. ↑ Farion, K; et al. (2002). Farion, Ken J., ed. "Tissue adhesives for traumatic lacerations in children and adults". Cochrane Database Syst Rev (3): CD003326. doi:10.1002/14651858.CD003326. PMID 12137689. Sheth, V. M.; Weitzul, S. (2008). "Postoperative topical antimicrobial use". Dermatitis: contact, atopic, occupational, drug. 19 (4): 181–9. PMID 18674453. ↑ Jull AB, Cullum N, Dumville JC, Westby MJ, Deshpande S, Walker N (6 March 2015). "Honey as a topical treatment for wounds". Cochrane Database of Systematic Reviews. 3: CD005083. doi:10.1002/14651858.CD005083.pub4. PMID 25742878. ↑ O'Mathúna, D.P. ; Ashford, R.L. (29 July 2014). "Therapeutic touch for healing acute wounds". The Cochrane database of systematic reviews. 7: CD002766. doi:10.1002/14651858.CD002766.pub3. PMID 25069726. ↑ Ghosh, P.K. ; Gaba, A. (2013). "Phyto-extracts in wound healing". Journal of pharmacy & pharmaceutical sciences: a publication of the Canadian Society for Pharmaceutical Sciences, Societe canadienne des sciences pharmaceutiques. 16 (5): 760–820. PMID 24393557. ↑ Bahramsoltani, R.; Farzaei, M.H. ; Rahimi, R. (September 2014). "Medicinal plants and their natural components as future drugs for the treatment of burn wounds: an integrative review.". Archives of dermatological research. 306 (7): 601–17. doi:10.1007/s00403-014-1474-6. PMID 24895176. ↑ "Light to detect wound infection" (web). UK scientists have identified a way of using light to rapidly detect the presence of bacteria. BBC News. 11 March 2007. Retrieved 17 March 2008. 1 2 Reichardt, Paul F. (1984). "Gawain and the image of the wound". PMLA. 99 (2): 154–161. doi:10.2307/462158. JSTOR 462158. Look up wound in Wiktionary, the free dictionary.